Hybrid VRF is the latest addition to our City Multi family (our VRF range of air conditioning units for large scale applications). The white Zen unit blends perfectly with light coloured interiors. The thin, stylish design expresses a sophisticated elegance and makes the units perfect for any applications, large or small. New brochure focusing on the market-leading range of Ecodan renewable heating systems and highlighting how individual businesses and premise owners can benefit. Our hybrid Ecodan heating systems deliver efficient, renewable heating in tandem with a traditional boiler. Mitsubishi Electric’s Ecodan heat pumps provide renewable heating, challenging traditional heating solutions, whilst meeting the energy and carbon reduction demands of today and beyond. Mitsubishi Electric has specifically designed the Ecodan range for UK homes. 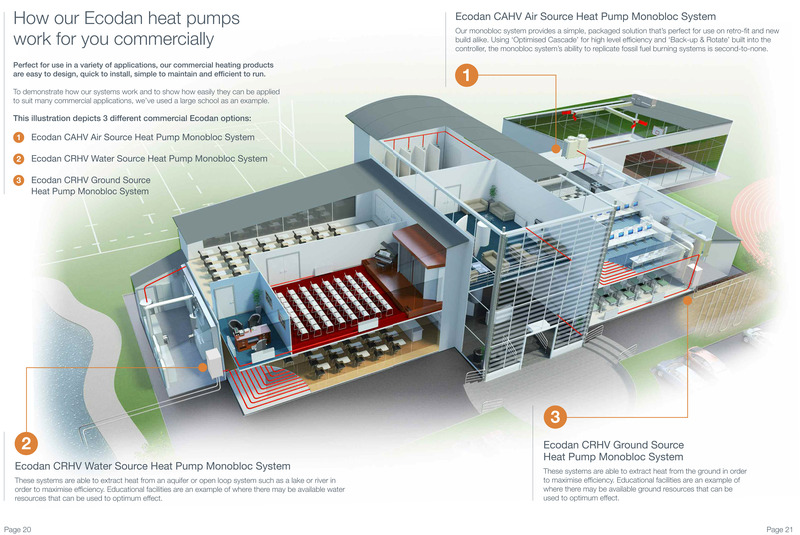 Ecodan air source heat pumps provide renewable energy to challenge traditional heating methods. Mitsubishi's unique HVRF (Hybrid VRF) system is the modern alternative to traditional methods of heating & cooling, offering simultaneous heating & cooling with heat recovery. Mitsubishi Electric range of Lossnay mechanical ventilation heat recovery (MVHR) systems are designed to supply fresh air into any building whilst simultaneously extracting stale air. This brochure will guide you through the range of products Mitsubishi Electric offer that provide innovative, carbon efficient solutions for commercial buildings. We are all under increased pressure to improve energy efficiency. Replacing old R22 air conditioning systems can make a world of difference. Known the world over, Mitsubishi is a trusted global leader associated with a variety of products and services, and is at the forefront of the air conditioning industry. Unsurpassed air conditioning from Mitsubishi Electric - Air conditioning is an ideal way of controlling the internal environment of any building, large or small. Mitsubishi Electric boasts an explicit commitment to sustainable business practices such as energy and resource efficiency, minimising ecological impacts of our products. A guide to help installers, specifiers, owners and users of air conditioning equipment to understand how the F-Gas Regulations will affect them. RHI offers an excellent incentive to switch from fossil fuels, which are becoming increasingly expensive, so the long-term savings on energy bills increase every year as gas & electricity prices rise. This CPD guide looks at the challenges faced by our built environment due to increasing legislation, the drive for energy efficiency and the need to reduce CO2 emissions. The latest free CPD-Accredited guide looks at the unique approach to heating and hot water provision that is needed for the new homes hat the nation needs to build to match demand. Mitsubishi Electric strive to continually meet the increasing demands of customers, being the first in the industry to offer highly advanced 'inverter driven' systems. Organisations facing the compulsory requirements of the Energy Savings Opportunity Scheme (ESOS) by the end of this year will be interested to hear of a free, CPD-certified guide. This is an independent guide produced by Misubishi Electric to enhance the knowledge of its customers and provide a view of the key issues facing our industry today. Part L of the Building Regulations deals with the conservation of fuel and power in domestic and commercial buildings. This is an independent guide produced by Mitsubishi Electric to enhance the knowledge of its customers and provide a view of the key issues facing our industry today. This is an independent guide produced by Mitsubishi Electric relating to Building controls which are vital to the energy efficient operation of building services equipment, and buildings as a whole. The aim of MEES is to raise energy efficiency standards in buildings across the UK by encouraging building owners and managers to undertake building upgrades to achieve better EPC ratings. Please tick below to indicate how Mitsubishi Electric may contact you.